Stadium : The Cooper Associates County Ground, Taunton. EN-W had scored highest total of T20 history in the last match. 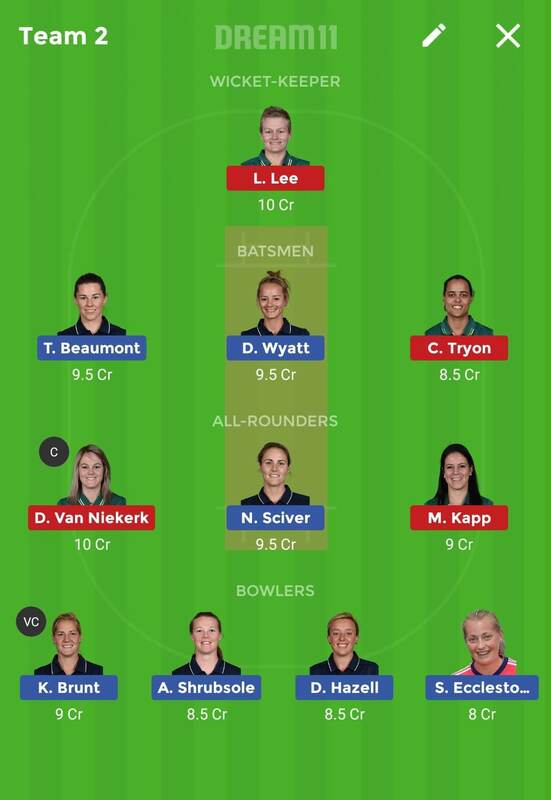 There is inclusion of Katie George and L Winfield but their playing chances are very less. D Hazell might make come back in playing 11. 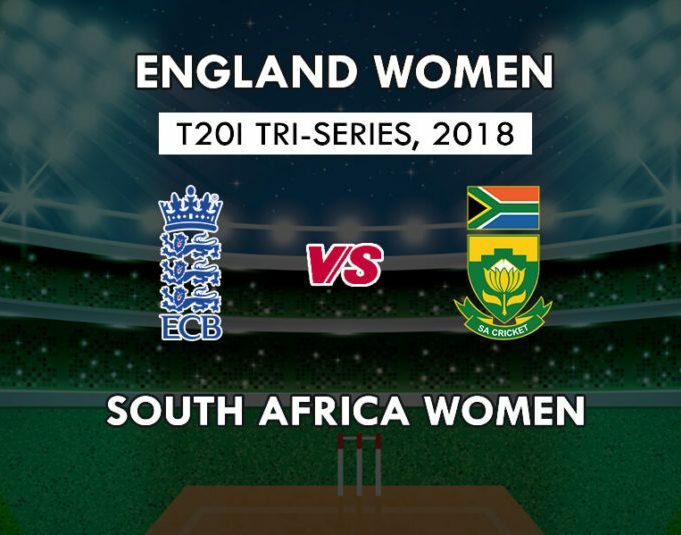 Sarah Taylor will come one down. 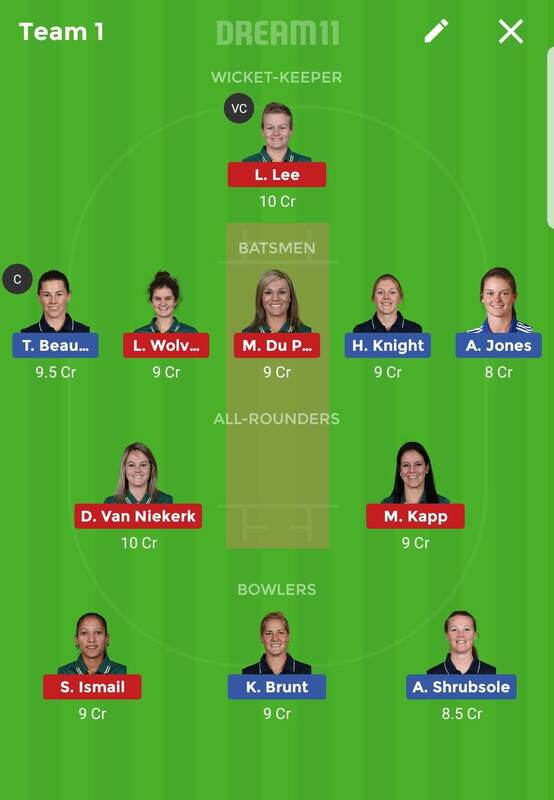 Most Probably EN-W will go with same playing 11 of previous match. Key players: N Sciver, H Knight, K Brunt, D Wyatt, S Ecclestone, J Gunn and A Shrubsole. 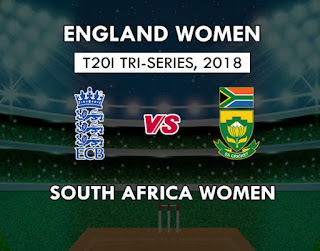 SA-W team made lot of changes in their 2 matches and they suffered lot due to this decision. M Du Preez will come 1 down. SA-W might make some changes in team. Places of T Brits, S Lackay, Sune Luus and M Klaas are risky that might make way for C Tyron, A Steyn and A Khaka. If C Tyron plays, she could be promoted anytime for big scoring. L Lee and L Wolvaardt will open the inning. Key players: Dane van Niekerk, Lizelle Lee, Laura Wolvaardt, M Du Preez, C Tyron, Shubnim Ismail, A Khaka and M Kapp. In WK both L Lee and S Taylor are good you can go with any one. 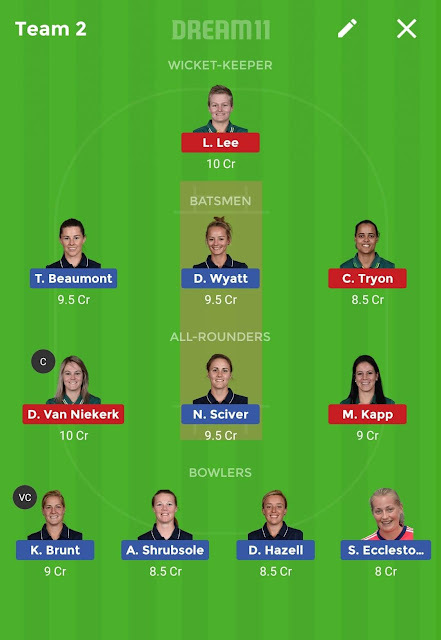 In Grand Leagues C Tyron is good choice of Capt. This is risky match as team made lots of unexpected changes and might rest some key players.